This week's featured product comes straight from the USA - thanks to my Mom and her fabulous eco-shopping skills (she also arrived rocking some fantastic J-41 shoes made partially from recycled Jeep tires and vegan materials). These gorgeous Food Network tea towels are 100% organic cotton and cute as can be. Traditional cotton production uses 16% of the world's pesticides, so by choosing organic cotton we reduce those chemicals running off into our land and water (not to mention the energy and water that was required to create and transport those pesticides in the first place). Organic cotton production also increases biodiversity and reduces soil-erosion compared to traditional cotton production*. 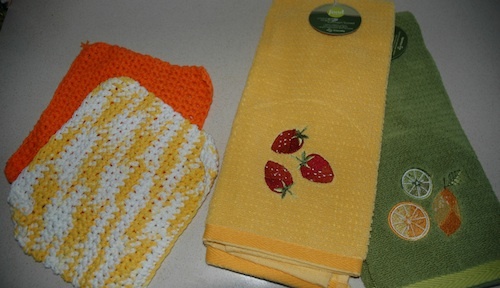 She also brought me some fantastic hand-knit oven pads made by her work colleague - such fantastic colours and just what I need to give my kitchen a little eco-colour.